It is an age of arcane wizards, bold warriors, holy knights, wily adventurers, and the noble and peasant masses, all pited against fell beasts and evil plots. While man is in the majority, the land is littered with elves, dwarves, goblins, orcs, dragons, and other wonderous beings. 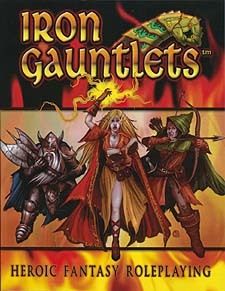 Because magic is diverse, Iron Gauntlets features the follwing forms: Crafting, the art of altering reality. Divinity, endowments from above. Essence, the power within. Totem, one's connection with the spirits. Each functions differently, but the game mechanics remain the same. Game-play is streamlined and flexible, using 10-sided dice, with options for playing diceless (via Active Exploits) or using two 6-sided dice (via GenreDiversion i). Plus you can easily customize the game with your own races, abilities, and more. Getting started is easy with story ideas, an expanded setting, and full-length adventure.